Narragansett Bay - Where the wind is fair (even in August), the water clear, the people warm, and the ports of call intriguing! Narragansett Bay, Rhode Island. To the right is the Sakonnet River. Click here to enlarge image. Not for navigation. We first cruised Narragansett Bay one summer when we set out from Rye on Long Island Sound headed for Martha’s Vineyard and Nantucket and the forecast just kept deteriorating. By the time we reached the harbor of refuge at Point Judith, we felt beat up. We wanted to continue but the rest of the week was to get even worse. Periods of rain, blustery winds in the 25-30 knot range daily, and rough seas. Maybe this wasn’t the year to revisit the islands. So we took out the charts and started studying. Buzzards Bay was likely to have the same issues. Block we’d just been to. The Elizabeth Islands would be exposed. Hey, what about Narragansett Bay ? We had no idea what lay beyond the bridge like many mariners who visit the m ecca at Newport . Why not? It looked interesting. So that year, we tucked into Narragansett Bay and explored to our great delight, a beautiful body of water, with secluded anchorages, quaint villages, and comfortable harbors. This year we had the opportunity to revisit the Bay, stopping at the ports of call we missed last time. And what a great visit it was. The weather couldn’t have been better. And the wonderful nature of Narragansett Bay in August is the great breeze that blows up every afternoon. The morning can be still as can be, but come 1300 hours, the ripples start building and it’s time to hoist the sails. But nothing’s far away, so not to worry, a short leisurely sail later, you’re comfortably situated for the night again. Best of all, the Narragansett Bay Reserve encompasses 2,353 acres of land on Prudence, Patience and Hope islands and 1,591 acres of water adjoining the islands out to a depth of 18 feet. Both Patience and Hope islands are uninhabited. The Patience Island component of Narragansett Bay Reserve is approximately 200 acresnearly the entire island. The Hope Island component of the reserve includes the entire 91 acre island, plus surrounding waters. The public can not visit the island during the summer, because it is a major rookery for colonial nesting wading birds. From our normal cruising territory in the Western Long Island Sound, it usually takes an overnight or a very long day to get as far as Point Judith. Rye to Stonington is about 85 NM. 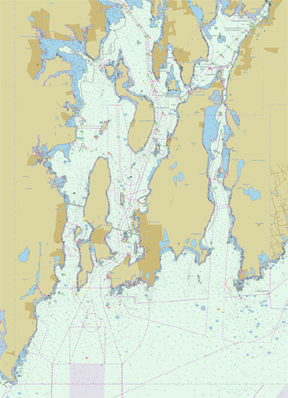 Many times, we head to either Stonington CT or Point Judith RI, pick up a mooring in the former or drop a hook in the latter, and take a break before continuing up into Narragansett Bay . Both are easy to get into (even in fog the breakwaters are easy to pick out by radar), offer protection from the elements, and a well-deserved rest. For our purposes here, we've chosen Stonington as our staging area from which to begin our weeklong cruise. Dutch Island Harbor , Wickford, and Newport . Larger scale, 1:20,000. Location: The reserve, designated in 1980, is in the geographic center of Narragansett Bay, 12 miles north of Newport and 12 miles south of Providence, and encompasses 4,259 acres.